Stretching across more than a million square miles of ocean in the Western Pacific, the Federated States of Micronesia is comprised of more than 600 volcanic islands and coral atolls. Archaeologist Felicia Beardsley characterizes this scattered tropical paradise as "a marvelous, but sadly neglected laboratory that may hold the answers to many important questions about migration and settlement across the Pacific." For the people of Micronesia, however, the discovery of the past has become an important element in their quest to revive and revitalize traditions and values that have been distorted by the lens of more than two centuries of successive colonial occupations. 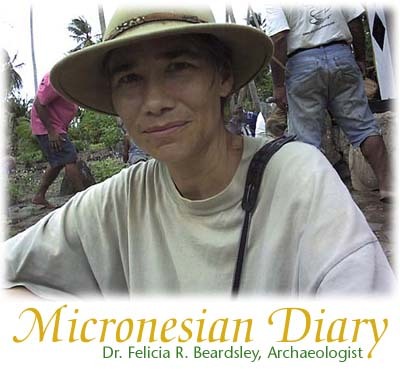 Join Dr. Beardsley as she travels across Micronesia, visiting the island states of Pohnpei, Yap, and Kosrae. From the sprawling 12th century stone complexes at Lelu and Nan Madol to the exquisitely designed traditional meeting houses of Yap she offers us a close-up and intimate view of both the pre-historic and contemporary cultures that together define Micronesia and its people. This presentation is designed for Netscape 4 and Explorer 4. If you cannot see the text above, you will need to upgrade your browser.